The magic hour of photography refers to the hour after sunrise and hour before sunset, when natural light appears warmer and more diffuse. It was for this reason that I decided to wake up at the early hour of 5:45 am on Sunday morning. What I didn’t know was that sunrise this far north wouldn’t occur until shortly after 7:00 am. 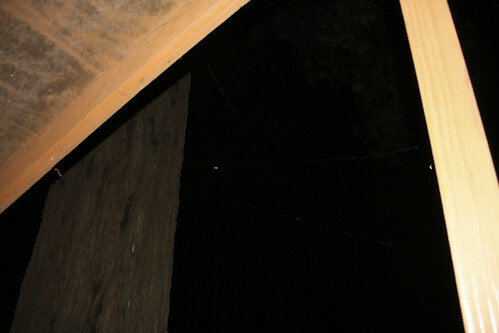 So fully awake, I looked out of our cabin door into darkness. What was nice about the darkness was that it allowed me to see the moon – which meant that the sky was clear and that it wouldn’t be raining this morning. This was good news after yesterday’s dark and wet drive. 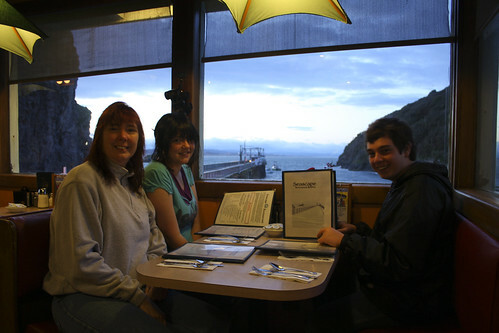 We went down to the Seascape restaurant for breakfast, which had an excellent view of Trinidad bay. Breakfast was excellent and very filling, thanks to some very generous portions. The morning sun rose and literally brightened our day. Due to the hour that we had arrived the night before, we were unable to take pictures of our cabin, so we made a point of doing that when we checked out. 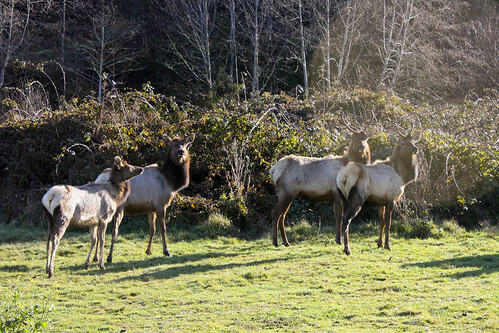 Christine has talked about elk and Elk Radio – “All elk, all the time” – often enough that I had planned to stop at a couple of locations along the way where they were known to graze. We happened upon a group of them and managed to get out of the car and snap some pictures before scaring the herd away. 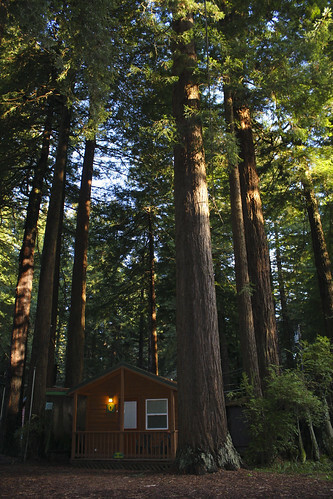 The next stop on our list was the last bit of the redwood forest. The weather was perfect for a short walk through the giant trees and the lighting was good for some pictures, even in the shaded groves of redwoods. 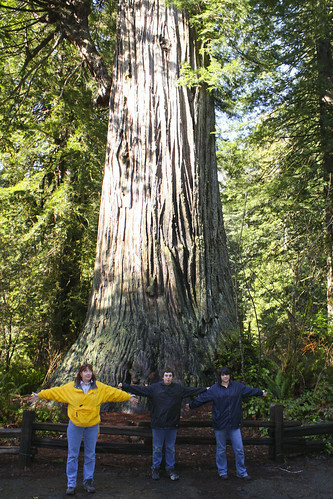 The 9-mile drive through Prairie Creek Redwood State Park is a great way to check out the redwoods if you’re driving along highway 101, but don’t have the time for an extended excursion into the forest. 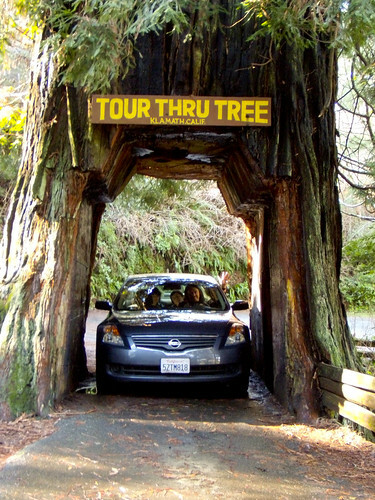 Another quick stop was just as we were driving into Klamath, California, where we got to drive the car through a redwood tree. 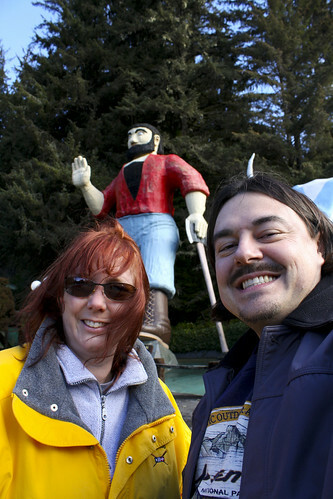 With the redwoods behind us our next destination was Newport, Oregon. The drive along the coast was beautiful, with the improved weather conditions. We made good time and still got to stop at a few places along the way that we found interesting. Arriving in Newport, late Sunday afternoon, we checked into our hotel and got in touch with my friends, Melanie & Brian. We decided on a place to eat and met them there for dinner. We decided to send the kids back to the hotel to watch a movie while the 4 of us went out for a few drinks. 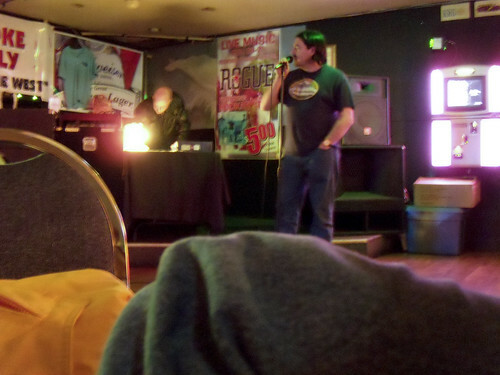 Melanie had it in her mind to get me to sing karaoke, which I only agreed to do after having a couple of beers. We had a lot of fun watching Brian and others sing, and enjoyed some good conversation before it was time to call it a night. It was good to finally meet them in person. This entry is gonna love you forever and ever, amen. This entry was posted on Wednesday, February 18th, 2009 at 9:41 amand is filed under . You can follow any responses to this entry through the RSS 2.0 feed. You can leave a response, or trackback from your own site.